£100 - non-refundable deposit secures any booking. Balance + £50 damage deposit to be paid 4 weeks prior to arrival please by bacs or cheque. We're happy to take weekend and/or mid-week bookings outside of the main summer season. 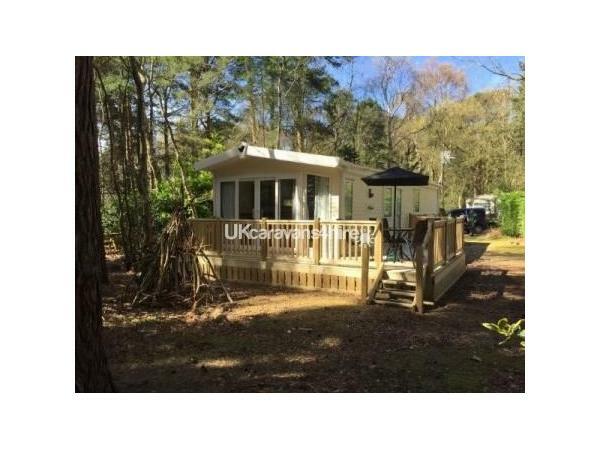 Thanks for taking a look at our holiday home at 304 Kelling Heath. The availability calendar on this site is amended after each booking, but do please email with any enquiries - we try to respond immediately, certainly on the same day! 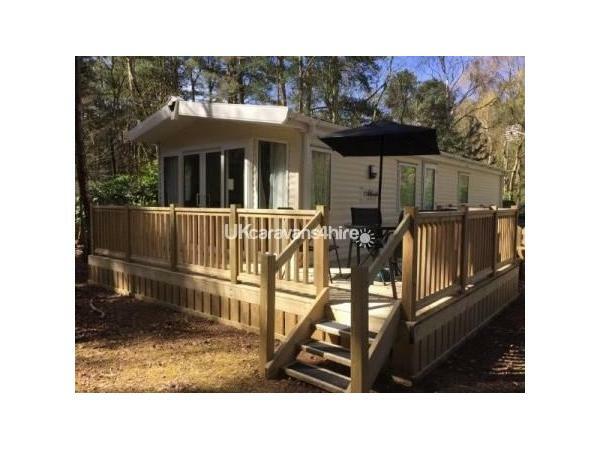 Our comfortable holiday home has a lovely master bedroom with a 5' bed, en-suite shower-room and a walk-in dressing-room/wardrobe and TV. The second room has twin beds which can be put together to make another 5' bed, and a shower-room (with double shower) opposite. All beds will be ready and waiting for you, but ask our guests to please bring their own towels and beach towels. Some caravans on site are fenced in but we have chosen to keep our plot natural, and quite open without fences or gates, so that visitors (and muntjac!) can roam around freely among the trees and ferns. with their feet on the soft forest floor. 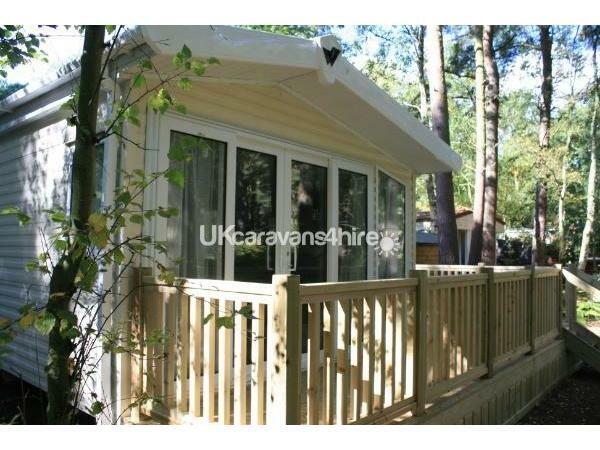 The caravan is fully equipped with everything we think you might need while on holiday, plus some extras. There is an ample supply of crockery, cutlery, glassware, pots & pans etc if you plan to eat in, or you have the choice of the restaurant on site, getting a take-away or sampling pubs and restaurants in neighbouring villages. 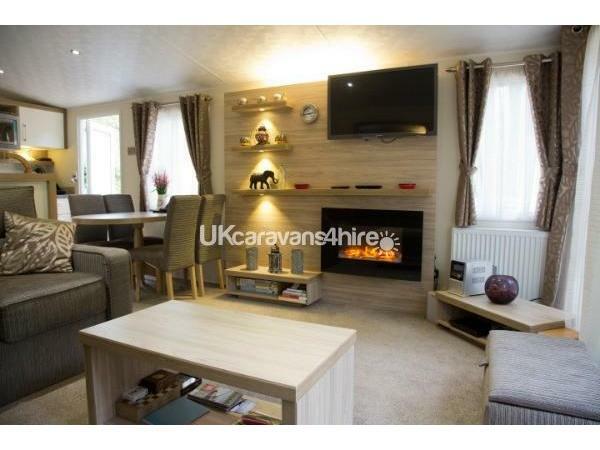 The caravan is centrally heated for those chilly days and nights and has an additional electric fire. There's a HD/3D Freeview TV and DVD player, a stereo radio/CD player and a further TV in the master bedroom . Wi-fi is available free in the restaurant/bar. 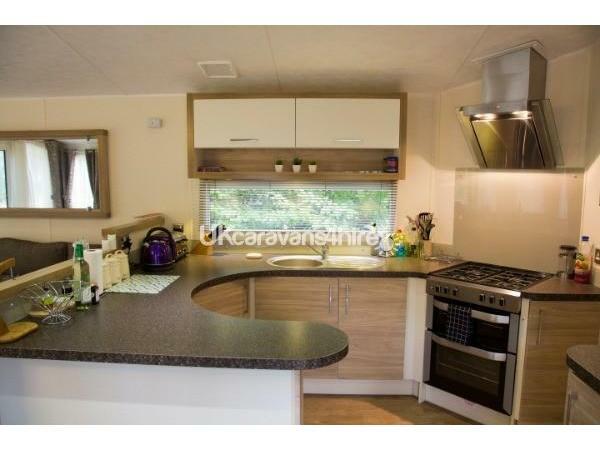 The caravan has a lounge area, dining area and kitchen with full-sized gas cooker and combi-microwave. There is a fridge and separate freezer. 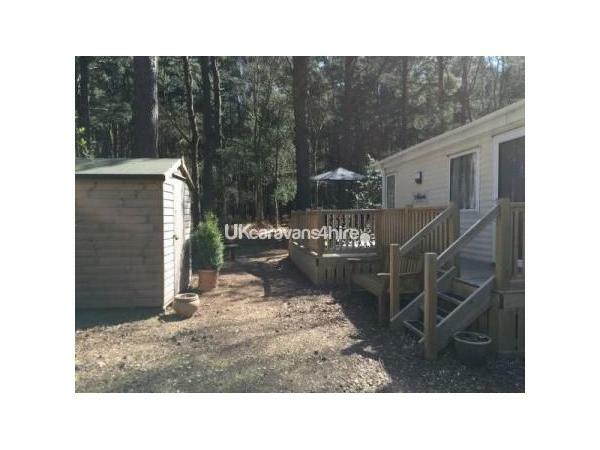 Outside in the shed you will find the Weber barbecue (using charcoal), and plenty of garden chairs to enjoy the peace and tranquility of the forest.There is enough space within to put boots, games and toys etc, and two children's bikes to explore the park. There is additional space on the decking, where you can put out the table and chairs. 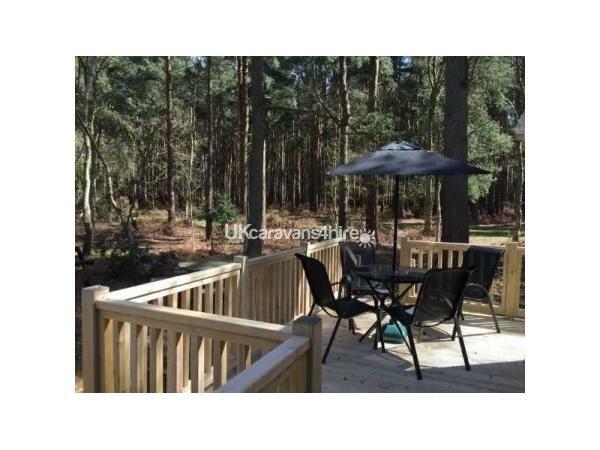 There's a bench to sit on, an 8-seater picnic table standing among the trees and an additional foldaway table for entertaining on the decking. There is an on-site launderette a few minutes' walk away in the village square and a place where bikes can be hired as well. Weybourne beach is just 5 minutes' drive away, with the North Norfolk Steam Railway even closer where you can park up and take a journey to Sheringham or Holt. You'll be within easy distance of many other stunning beaches and will be spoilt for things to do whilst at Kelling Heath - the 2013 Park of the Year. If you're looking for peace and quiet, nature and wildlife walks, this is for you. If you like a bit more action, then there are activities in the Village Square every weekend (including a lot of live music) and every day in high season, and of course much to see and do as you find your way around lovely Norfolk villages and the picturesque - and often deserted - coastline. 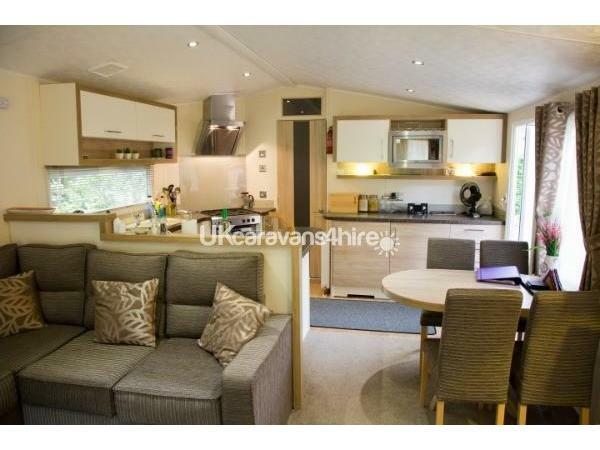 Had a lovely stay in this very comfy and beautiful caravan. Positioned in such a peaceful spot with wildlife all around you it was so relaxing. 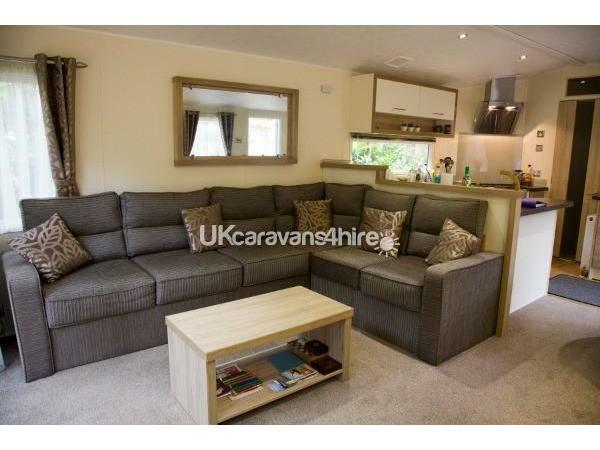 Along with a very very comfortable 5' bed, there was everything in the caravan you would need. It was very clean with loads of little extras included which really made it home from home. Communications were good with Tracey and for so many reasons we would definitely recommend and hope to be back next autumn. Cannot wait!! Great facilities, easy to arrange and deal with, would love to return.